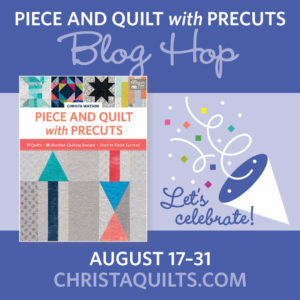 I’ m very excited that our friend Christa Watson has a new book, Piece and Quilt with Precuts! Christa is an awesome teacher and all around great cheerleader for quilting and modern quilts. 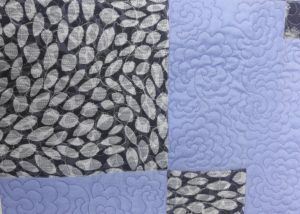 Her new book focuses on both using precut fabrics of all sizes and how exactly to quilt those quilts. Taking the guesswork out of that step can be quite liberating, as we’ve seen on our “How Should I Quilt This?” episodes of the show. To help Christa celebrate, we’re participating in her blog hop, and have made a version of the Kites quilt. The original pattern uses a 10″ full layer cake, 5″ charm pack, and 2 1/2″ square pack plus background fabric and to make a queen sized quilt. I scaled it down a bit to make a lap size with only 9 blocks. 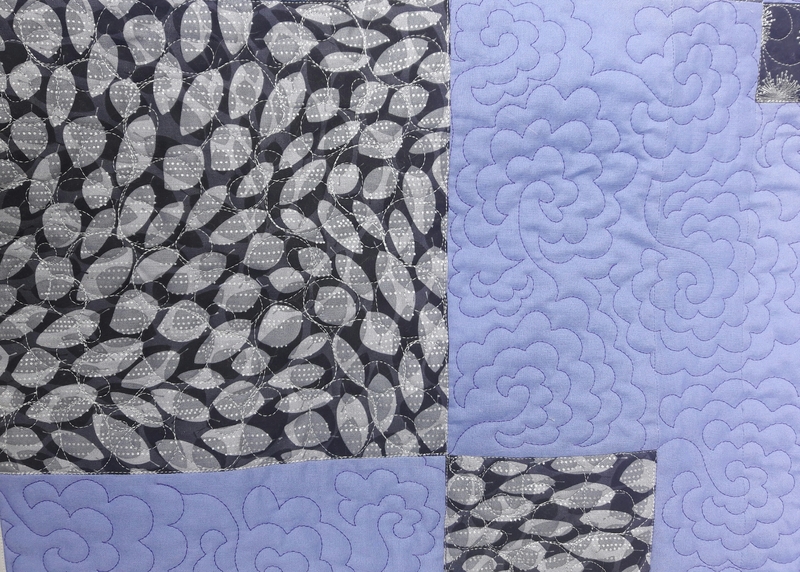 The quilting uses two different designs: one in the background and one in the precut fabrics. My favorite of the two is the Packed Flowers design in the purple background, which you can see in this close-up! You can see the other versions of the Kites quilt and all the quilts in the book by visiting Christa’s master post for the blog hop. Some of the other blog hoppers are hosting giveaways, so check them all out! To get your own copy of the book, you can get a copy directly from Christa’s store (which she’ll autograph! ), Amazon, or check your local quilt shop! Since I was leading my last quilt guild meeting and our guest speaker was stuck in rainy traffic I used the subject of unconventional sewing tools for the discussion. Plus it gave me yet another opportunity to put in a plug for thestitchtvshow.com. Nice color choices, I wouldn’t have thought to pick those. Love, love, love your quilt! Great color choices!! Loving the color choice. I guess I could size the blocks down for a baby quilt? I find your quilt color combo pleasing to the eye. Great inspiration! I like your color combination…really makes the quilt sing! I love simple quilts like this for charity sewing. Thanks. The color combination is great! ! Beautiful quilt, love the colors!! I love the purple background with those grays. beautiful amazing work as always! 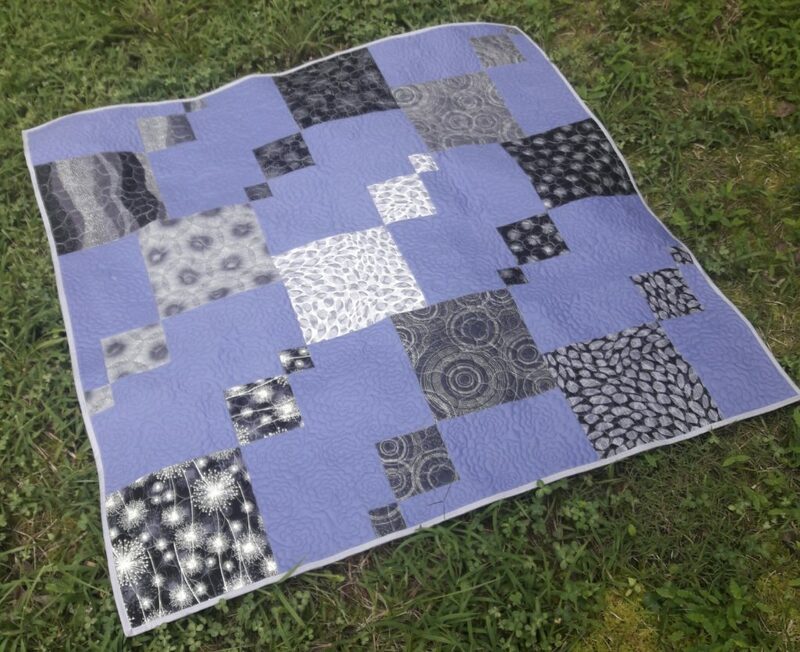 I hope to me able to tackle free motion quilting one day! Great fabric choices…I suddenly thought of all the men I would make this for! Your quilt came out beautifully! Thanks for sharing! Great job! I love your quilting choices. Like the color combinations-not usual but striking.